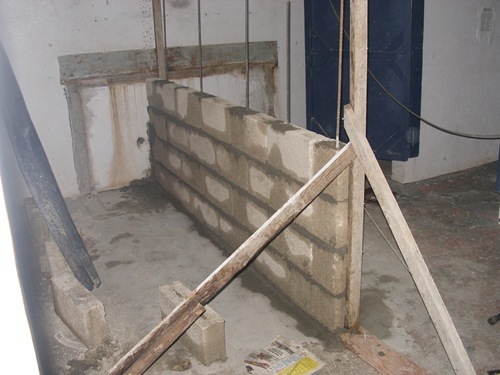 On November 14, 2007 renovation work began on the only men’s bathroom and laundry facility at JBI. 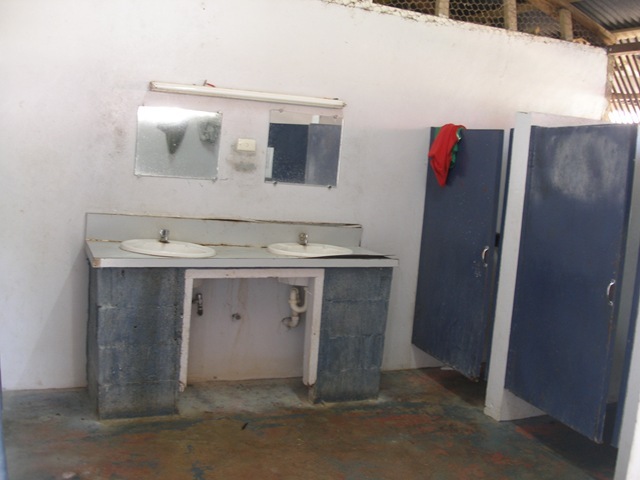 The bathroom needed repairs and more facilities to accommodate the increased number of male students on campus. A partial central wall is being built to hold six new sinks. A fifth shower stall, new urinals, and floor and wall tile will be added. Areas which had not been plastered or finished in the original construction will also be completed. Two new doors, shower curtains, increased lighting and mirrors will be needed. This is the “before” renovations photo (below) of the bathroom. PROGRESS REPORT : The old double sink and counter have been taken out and the new wall which will accommodate 6 new sinks (three on each side) is going up. 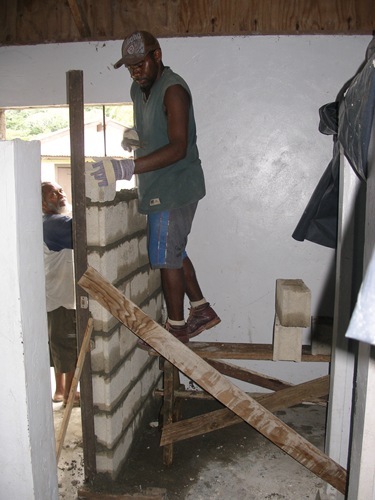 Job and Pastor Robert (photo to right) are building a new entry wall which will conceal the urinals. Outside the men’s bathroom under an awning is the laundry area where the men hand wash their clothes. Presently there are two sinks and old wooden table tops along the bare concrete wall for washing. A third sink, new ceramic tiled countertops and wall tile are needed. These changes will allow more students to wash clothes and keep the area drier and cleaner. This complete project is budgeted at $5,000.00. Thank you to those who have given towards this project, your contribution is greatly appreciated. We currently have the funds to complete this project. Completion time: early December. See update on Bathroom progress. 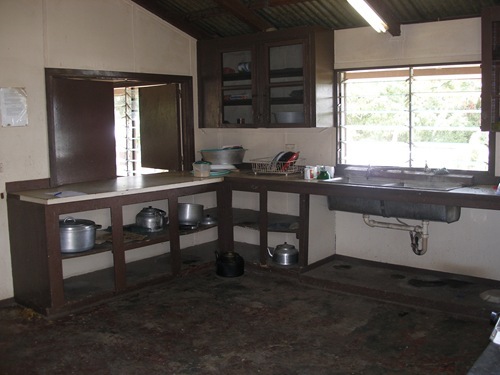 The JBI kitchen and cafeteria building needs interior renovation, new appliances and a new corrugated iron roof before the new school term starts on February 12, 2008. 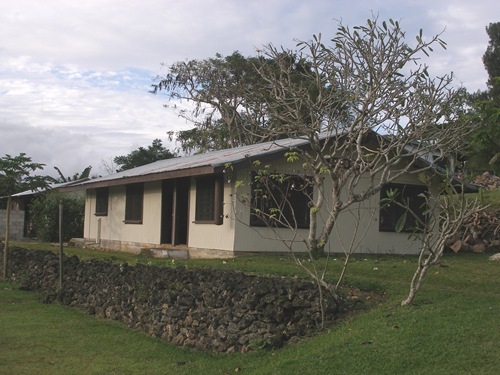 This timber building was originally built in 1980 and has withstood numerous earthquakes, yearly hurricanes and tropical termites. Renovation work is needed if this building is to continue serving JBI in the years to come. We need approximately $30,000.00 to adequately refurbish the inside of this building and the roof. Renovations should start in mid-December as funds permit. Below is a view of the current kitchen cupboards and sink area. The cupboards were not emptied for the photo but there is obviously a need for more dishes and cooking utensils. The old plywood/chipboard cupboards will be replaced with new ones and tile countertops. To help keep the kitchen cleaner, the floors will be tiled, the ceiling closed in, and the wall behind the countertops will be also be tiled. The photo to the right shows the other side of the kitchen. The school’s freezer quit working a few months ago and cannot be fixed. A larger refrigerator and freezer are needed. 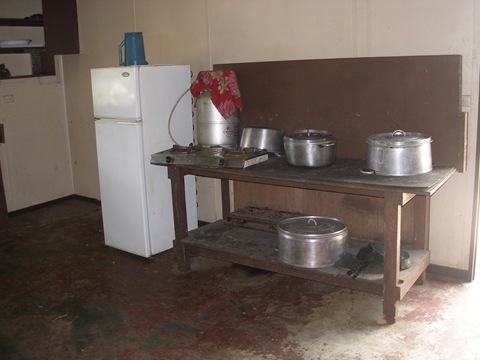 The two burner hotplate (see photo) will be replaced with a larger gas burner which can handle large pots for cooking rice. A regular gas stove will also be purchased. 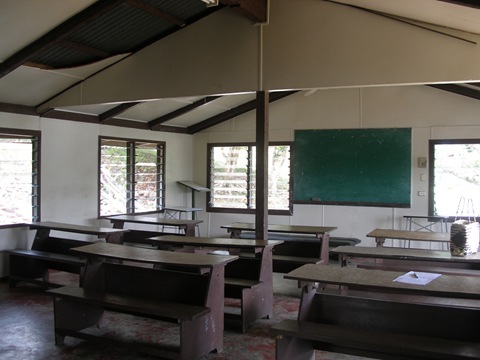 To the left is a view of the dining hall which also serves as the first year classroom. Our next project is a new two classroom/library building so we can get this classroom out of the cafeteria. Currently students sit at their desks to eat. Below is a photo of the cafeteria roof from the hill above. The rusty roof needs to be replaced. Joy Bible Institute is a 3 year program. The school currently has only two classrooms and in one of them are several shelves of library books. The remainder of the school’s library books are currently in storage because there is no place to display them. The students have no access to them for study! 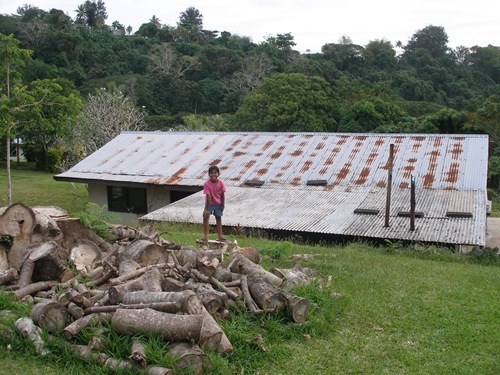 A NEW building is urgently needed to provide a library and at least two classrooms. Plans are being drawn up and we would like to begin construction by mid-2008. Click here to donate to this project. Thank you so very much! Click here for other Small Projects. This is a really good web site! Easy to read, concise, informative and first class. Thanks.